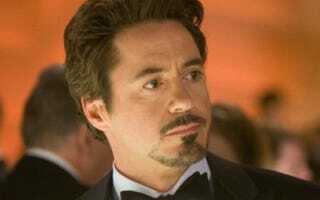 Is Robert Downey Jr. Really The Entertainer Of The Year? Entertainment Weekly has named Iron Man's Robert Downey Jr. as their choice for the entertainer of 2008 - and while we may have loved Jon Favreau's metal Marvel hero movie, we're unconvinced that Downey Jr.'s necessarily the right man for the title. What about Heath Ledger, the unintentionally-entertaining Michael Bay (C'mon, "Bayhem" is definitely the word of the year), JJ Abrams, or even - considering Clone Wars and The Force Unleashed - George Lucas? Vote in our poll below, or use the comments to make the case for your write-in vote. Is EW insane? Who is your SF Entertainer Of The Year? (Yes, I know there are two "Other"s - I am a moron. Kindly ignore the one that doesn't give you the chance to write-in your choice.) Voting is open until 12am Tuesday morning. Vote early, vote often.